This entry was posted in Knit, Uncategorized and tagged fitting, jam, Vodka Lemonade. Bookmark the permalink. I’m still in a weird, feel no desire to knit right now, phase. I’ve been spinning instead. I’m also still weird in that I prefer my strawberry jam as a freezer jam. Its the one berry for me that gets a weird plasticy flavor when heat processed. It just totally changes the flavor of the berry. So I get a freezer full of strawberry freezer jam and a pantry full of all other berries. 😉 Really hope that I can get some raspberry jam done this year. I don’t have a very creative mind so I have to follow a pattern to a tee. I seem to like patterns that aren’t too complex but not too easy. I like something I can watch television while knitting. 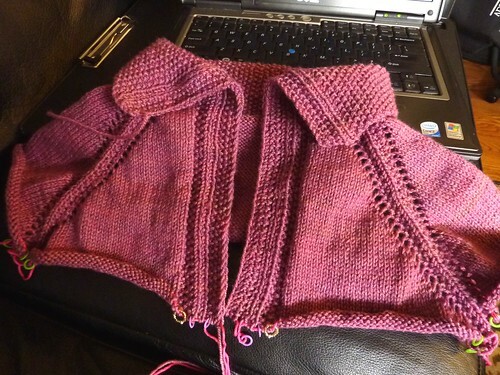 I’m finishing up the Aestlight shawl and it’s a perfect knit for me. That jam looks amazing. I want to learn to can but I’m scared of botulism! 🙂 Your sweater looks fantastic! Botulism isn’t really an issue with high acid, high sugar food (jam). Mold might be, if you don’t handle things right, but that would be pretty obvious. 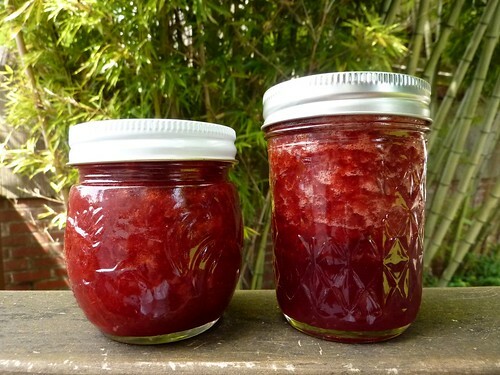 Botulism is an issue with low acid things, which is why I only make jam, no canned veggies or meats. I’m a big chicken! Sweater is a fun knit so far! I have the exact same issue with jam! I’ve been told by someone who makes more jam than I do to invert the jars after they’ve sealed, but she believes you just have to do it the once, and then leave it be. If your jam is pretty thick, it *might* take a while for the fruit pieces to make their way to the top. Once is probably enough! I did play with one of the jars before it cooled completely, and it looked better than the rest. I think it just gets thicker as it cools, which keeps the fruit from moving around so much. So one inversion after it’s sealed while it’s still hot, and then turn it back after a bit so that it’s not all stuck to the lid. Round two begin! I imagine flipping the jar a few times would distribute the fruit better throughout the space. 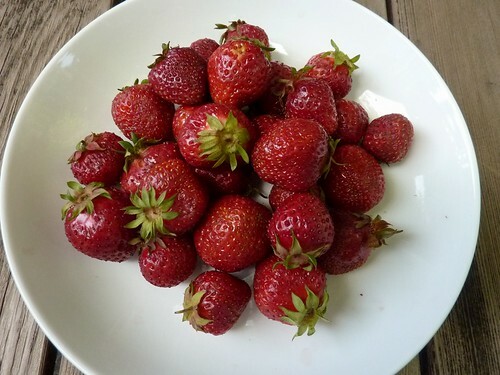 Strawberry balsamic jam sounds delish–sweet and sour. I like to add a kick to it by adding jalapeno. After three sweaters, I am doing a light leafy scarf until new yarn to arrive for two more shop samples 😀 I like some intricate details that is intuitive in my knit, absorb, memorize, then off to knitting without looking at the pattern and instruction. That’s my kind of happy knit. Oh, that jam looks delicious! What lucky recipients. I usually have a couple of projects going. Easy knitting for car trips – for taking with me in general, it can’t have a bunch of directions or charts. Medium knitting for tv, and hard (six charts, a zillion mirrored cables, tiny needles, add as you go beads, etc) for a specific thing I want to own.